....with a new Ku-band platform on the Yamal-201 satellite. Offering significant opportunities to penetrate the cable market throughout the CIS, GlobeCast's capacity provides full coverage of this area to regional and international channels. Uplinked from Moscow, and located at 90 degrees East, GlobeCast's distribution platform on Yamal-201 will offer FTA (Free-to-Air) or encrypted channels very wide coverage from Eastern Europe to east of Japan, and from North China up to Siberia. 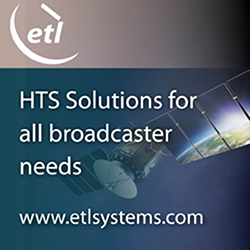 The satellite has been live since 2003 and boasts more than 70 diverse prime Russian and regional programs, with 90 percent penetration of cable operators and a potential reach of more than 16 million cable homes. With this new platform, GlobeCast is once again showing its commitment to offering premium services to broadcasters in this growing region.